In ancient Mesoamerica most cutting tools ranging from simple household knives to surgical scalpels and ceremonial blades were manufactured from a natural volcanic glass that the prehispanic people called iztli and we know as obsidian. A core-blade technology developed in this region that produced razor-sharp prismatic blades that were used in most every prehispanic household. The concentration of natural source deposits of obsidian in only a few highland regions led to the development of a specialized craft industry that produced a ready supply of prismatic blades. The high demand for obsidian blades resulted in obsidian being traded in a variety of forms hundreds of kilometers across Mesoamerica to meet the needs for cutting edge of its thriving populations. Photo 1: Conference participants posing with the Penn State Nittany Lion. Front row left-right: P. Kelterborn, K. Hirth, J. Flenniken, J. Woods, R. Trachman. Back row left-right: J. Clark, D. Healan, P. Sheets, A. Pastrana, J. Pelegrin, B. Andrews, G. Titmus, J. Tixier. Photograph by Jim Woods. 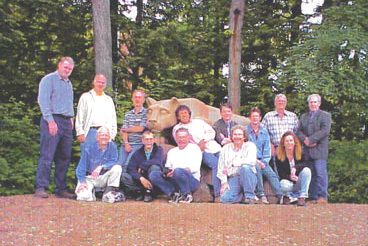 Between May 22-28, 2000 a conference on Mesoamerican Obsidian Pressure Blade Production was held at the Department of Anthropology on the campus of Penn State University. The purpose of this conference was to expand our understanding of the technological processes and sociopolitical forces that shaped the development of this important industry. The reason for focusing on the obsidian pressure blade production was threefold. First, obsidian production was one of the fundamental technological industries of ancient Mesoamerica which impacted virtually all of its prehistoric inhabitants. Second, unlike many other craft technologies, obsidian craft production can be studied archaeologically from production residues that it leaves behind. 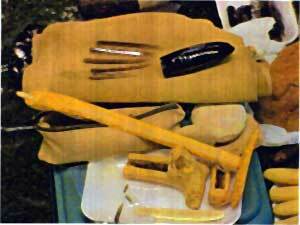 Third because it can be readily studied, obsidian craft production is often used as a general model for discussing the organization of other craft industries in ancient Mesoamerica which are largely invisible in the archaeological record. Our general understanding of obsidian production technology and craft organization was established during the 1970s and has come down to us today in largely unmodified form. Unfortunately, research over the past decade has revealed that established and current models of obsidian craft production have been flawed in several ways. First, they underestimated the range of techniques employed in manufacturing obsidian prismatic blades which were fundamental to understanding the production process. Second and more importantly, they oversimplified the effects that natural conditions and social factors had on structuring the obsidian production process. A great deal of the variation in obsidian blade production systems was lost or being ignored through the use of overly general models of technological processes that masked the very production processes that we wanted to study. As a result we felt that there was a current, critical need for the Conference on Mesoamerican Obsidian Blade Production in order to evaluate our current models of obsidian production, propose modifications that better account for the variation seen in reduction sequences throughout Mesoamerica, and test these modifications using a lithic technology approach and experimental replication. The conference brought together thirteen specialists from Europe, México, and the United States (Photo 1) (Table 3) in a 5-day meeting that was funded, in part, by an award from the Foundation for the Advancement of Mesoamerican Studies, Inc. (FAMSI). The conference used an innovative combination of formal presentations, experimental replication, and brainstorming sessions to shape a new understanding of ancient obsidian blade production. I believe that all of the conference participants felt the conference was a resounding success. We all left the conference with a better understanding of both what we know and dont know about Mesoamerican obsidian production. It has helped to expand our individual and collective future research agendas and we hope to meet again in four years to assess where the applications from this years conference have advanced our understanding of Mesoamerican obsidian blade technology.